I love Cyclades. I have heard that its younger brother Kemet is a better game, and that may well be, but in terms of theme, Greek mythology holds more sway over me than Egyptian. Kemet is, broadly speaking, an Egyptian-themed Cyclades, that comes with improved mechanics. But I’ll take a horrific, titanic, unimaginably destructive Kraken over a mewling cat god any day of the week, so Cyclades is the game for me. At first glance, Cyclades would appear to be your common or garden-variety ‘guys on a map’ type game, with myriad islands of the Greek Cyclades being occupied by troops and fleets of opposing players. Your army can attack and conquer, and you can fortify your islands with ports and fortresses. In the name of civilisation, temples and universities are also an option (how classically Greek). 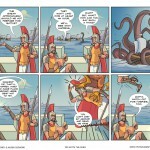 In fact, victory in Cyclades is not even necessarily achieved through martial means. The first player to build two metropolises on their islands wins. A metropolis is constructed by having one of each of the four aforementioned buildings under your control. Of course, you can just wait until your opponents have built theirs and then conquer it with troops. All standard stuff so far, but the actual mechanics of how this works is what makes Cyclades so different. The game is played out in the Greece of ancient myths and legends; the Greece where gods and monsters ruled and roamed the earth, and mankind was at the mercy of their whims. Your territories in Cyclades earn you gold, and at the start of each turn, you will bid against the other players for the favour of the gods using this gold. It amounts to a type of auction, where you will be striving to earn the favours, and hence powers, of one of five different gods each turn. With Ares on your side, you can increase your armies and use them to invade. Ares will only help you with land engagements, though. If you want to dominate at sea, you will of course need Poseidon. Thus, your turn becomes wholly dictated by the god you have chosen (or indeed, have been forced to choose after being outbid on the actual god you choose). So while the gods determine the course of the game, the monsters add colour and allow you to disrupt the plans of other players in wonderfully chaotic ways. As well as bidding on the gods, on their turn a player can also harness the power of the likes of the Kraken, Harpies, the Sirens and Pegasus, allowing them to destroy fleets, stop invasions, and reverse the fortunes of others. All these actions are of course performed to the satisfying background symphony of teeth being ground in frustration as a Kraken rears from the depths to wreak havoc on a well-planned naval assault. It’s not total chaos, of course. Everyone can see the monsters available to bid on, and thus have the opportunity to take them in a preventative measure. Cyclades then becomes one of those great games where you never have the resource to do everything you want to do, and each turn becomes wrought with difficult decisions. Taking a monster to prevent your opponent advancing only becomes possible by sacrificing precious resources and slowing down your own plans. It’s not a perfect, game. Although the map changes with different player counts, with fewer than five players not all of the gods are available to bid on every turn. In some three player games this hampered progress, as without certain gods you simply cannot progress. But overall it is a lot of fun, and certainly to be recommended. Unless Pharaohs, sphinxes and cat gods are your bag. In which case, check out Kemet.